In this fifth and final installation on biodiesel production we will cover biodiesel purification. There are two distinct process for biodiesel purification. One is removal of methanol by distillation and the other is removal of glycerin and the sodium methylate catalyst by ion exchange. The crude biodiesel product is preheated in a heat exchanger (not shown) that uses the bottoms stream of the biodiesel column as the heating medium. Column is a 6 tray tower that is operated at partial vacuum. The pressure inside column is controlled by a pressure sensor and automated valve that allows a bleed of nitrogen into the column. The liquid bottoms leaves the tower at 99.3 wt% biodiesel. The bottoms is cooled to the feed preheater mentioned above, and finally cooled in exchanger using cooling water as the cooling medium. The liquid level in reboiler is controlled by sensing a signal from a level transmitter and adjusting a corresponding flow control valve on the discharge of pump such that the level is maintained at the desired set point. (The flow control valve has the effect of throttling the pump by shifting its operating point.) No temperature controls are provided since the temperature of the feed exiting the exchanger is limited by the temperature of the bottoms and it is advantageous (more energy efficient) to transfer as much heat as possible from the bottoms to the feed. Product cooler is controlled by sensing the process stream exit temperature and throttling a cooling water flow control valve to maintain the exit temperature at the desired set point. The crude biodiesel product is fed to an ion exchange system, consisting of two parallel vessels to remove trace amounts of glycerol and the sodium methylate catalyst. The ion exchange resin is periodically washed with methanol. The methanol wash stream is recycled back to the recycle methanol tank for reuse in the reaction. The glycerol/sodium methylate recovered in the ion exchange system ultimately ends up in the product glycerol. The ion exchange glycerol and catalyst partition with the glycerol in the phase separator. The stream leaving the ion exchange skid contains 99.9 wt% biodiesel, 0.1 wt% methanol, and the balance being trace amounts of water and unreacted oil. This is the final biodiesel purification step. The overhead stream containing predominantly methanol is condensed and fed to a methanol column. The overhead is condensed to maintain a continuous stream flow in the event that the biodiesel column is shut down. A condenser is controlled by sensing the process stream exit temperature and throttling the cooling water flow control valve to maintain the exit temperature at the desired set point. The reflux rate from the reflux drum is critical to a correct plant production rate. Accordingly, the flow is controlled with a flow meter and flow control valve on the discharge of a reflux pump, as well as a level transmitter and level control valve on a reflux drum. This is the recovered methanol stream. The crude glycerol product is preheated to in a heat exchanger using the bottoms stream of the glycerol column as the heating medium. The column is a 12 tray tower that is operated at a partial vacuum. The pressure inside this column is controlled by a pressure sensor and automated valve that allows a bleed of nitrogen into the column. Feed comes from a feed drum, introduced into the glycerol column by a pump. The level in the feed drum is controlled by sensing a level transmitter, and adjusting a variable frequency drive on said pump. The liquid bottoms leaves the tower containing 88.3 wt% glycerol, with the balance being predominantly catalyst and water. The bottoms are cooled in the feed preheater and glycerol cooler combination. The liquid level in a reboiler is controlled by sensing a signal from a level transmitter and adjusting a variable frequency drive on a pump such that the level is maintained at the desired set point. There are no temperature controls provided since the temperature of the feed exiting the exchanger is limited by the temperature of the bottoms and it is advantageous (more energy efficient) to transfer as much heat as possible from the bottoms to the feed. A product cooler is controlled by sensing the process stream exit temperature and throttling a cooling water flow control valve to maintain the exit temperature at the desired set point. The overhead stream containing predominantly methanol is condensed and fed to the methanol column. The overhead is condensed to maintain a continuous stream flow in the event that the glycerol column is shut down. A condenser is controlled by sensing the process stream exit temperature and throttling the chilled water flow control valve to maintain the exit temperature at the desired set point. The reflux rate from the reflux drum is critical to a correct plant production rate. Accordingly, the flow is controlled with a flow meter and flow control valve on the discharge of reflux pump, as well as a level transmitter and level control valve on the reflux drum. 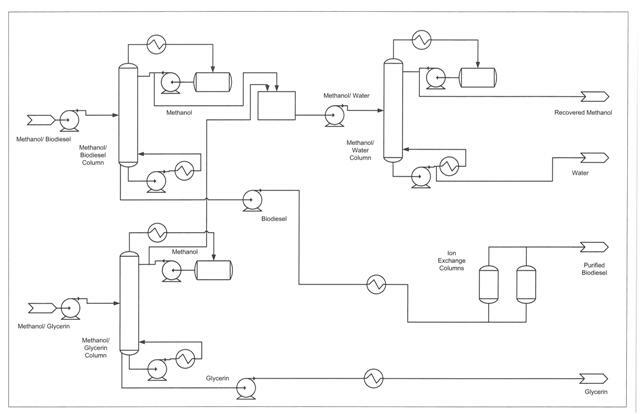 The unpurified methanol streams from two columns overhead are combined and fed to the methanol column. The column operates at a partial vacuum. The pressure inside the second column is controlled by a pressure sensor and automated valve that allows a bleed of nitrogen into the column. Feed is introduced at tray 9 if esterification is running and tray 16 if esterification is not running, due to the different water contents in the feed. Feed comes from a feed drum, introduced into a methanol column by a pump. The level in the feed drum is controlled by sensing a level transmitter, and adjusting a control valve on the discharge of a pump. The liquid bottoms leaves the tower containing 99.8 wt% water, and is then disposed of as waste water. The liquid level in a reboiler and a column is controlled by sensing a signal from a level transmitter and adjusting a corresponding variable frequency drive pump on such that the level is maintained at the desired set point. The overhead stream from containing purified methanol (99.9 wt %) is condensed and recycled back to the process. A condenser is controlled by sensing the process stream exit temperature and throttling the cooling water flow control valve to maintain the exit temperature at the desired set point. Vacuum on the distillation column is maintained by a dedicated vacuum pump. This vacuum pump is connected to a knockout pot and water scrubber to condense methanol vapors that are returned to the methanol recycle stream. Safety has been a major concern in both the process and mechanical design of these biodiesel purification units. Consideration has been given to the fact that the distillation columns will be operating under vacuum. In particular, the situation where one column is not operating and could impact the flow and pressure profiles of the other columns has been carefully considered. Relief valve discharges will be collected and vented to a dedicated collection system, where methanol will be removed before release to atmosphere. On shut down, on all three distillation columns are back filled with nitrogen gas instead of air as the vacuum system is turned off. This prevents flammable mixtures of methanol and oxygen from building up inside the columns. On startup, the nitrogen is drawn out by the vacuum pump system. All pressure vessels that operate over 14.9 psig are designed to the American Society of Mechanical Engineers (ASME) pressure code which is enforced by all 50 states. All electrical components and electric systems are compliant with the latest version of the National Electric Code. COSTELLO implements one-of-a-kind process engineering with exceptional knowledge and experience. We also provide process safety support and superior customer service. Visit our website today to see how we can help you with your Biodiesel project needs!